LynchyRightNow: Say It Ain't So . . It's so, and it's unprecedented. The team that finished 66-96 in 2007, the Tampa Bay Rays, with Major League Baseball's worst record, currently has an American League East crown on it's radar. The Boston Red Sox are four and half games back and the once untouchable, New York Yankees, are 3-7 in their last ten games putting them 11 games off the pace. Not even the Tampa Bay Rays themselves would have guessed they'd have 11 more wins than they did last season . . . .WITH 37 games remaining. After the Rays wrap up their 3 game set with Anaheim tonight, a set in which they've taken the first two games, the Rays match up 13 more times against opponents who are in the playoff hunt. Aug. 22nd - Aug. 24 (3 games) against Ozzie Guillen's Chicago White Sox. The Rays are 4-3 against the White Sox in 2008, but they haven't played each other since June 1st, when the Rays were still a punch line. The White Sox, while only winning three games this season against the Rays, have outscored them in the series 24-16. For a team that just lost Evan Longoria (22 HR's, 71 RBI's) that doesn't bode well. Even though the Rays have solved some of their road woes (currently 30-31 away from St. Pete), the White Sox are 44-19 in Chicago, where these upcoming three games take place. The next time the Rays play a team involved in the hunt isn't until September 8th, when they arrive in Boston. Between September 8th in Massachusetts, through September 17th in Florida, the Red Sox and Rays square up (6) times. This will be the first sniff of playoff atmosphere for the young Rays. The most significant role in this series may be that of the New York Yankees, who get three games against the Rays sandwiched in between two-three game sets with the Red Sox. Before the Rays head back to St. Pete they will have completed a 3-city, 9 game road trip, this close to the end of the season with the division title looming will provide plenty of pressure for Tampa. Teaser: These six games will determine the American League East champions. After facing division foes from August 26th to September 17th, Toronto (6) Baltimore (3) New York (6) and Boston (6), the road doesn't get any easier for Tampa. The remaining four games against playoff caliber teams will be a four game set at "The Trop" against Minnesota, from September 18th to September 21st. The surprising Twins are 71-54 and sit a game back of the division lead in the American League Central. For the Twins, being 71-54, close to the division lead, and only a game and a half back of Boston for the Wild Card, after just trading their top pitcher (Johan Santana) this past off season is somewhat of a miracle. 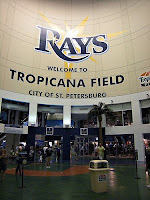 This series will be the be the last four games the Rays play at Tropicana this regular season, barring an absolute implosion this Rays team will revisit "The Trop" for October baseball. (that's a sentence I thought we were twenty years from) Twins v. Rays has playoffs match up written all over it, not only could this be an important regular season series for Tampa but it may just be our preview into the playoffs. Six games against division rival Toronto, whom the Rays have dominated this season going 9-3 in their first 12 games. The Blue Jays kick off Tampa's six game home stand on August 26th, then kick off the Rays 9-game road trip on September 5th. 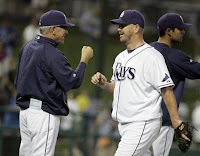 The Rays get seven contests with the Baltimore Orioles, 8 wins and 3 losses already to the O's, expect much of the same. The Rays go to Baltimore to play the last 4 games of their season series entering the last week of regular season play. Coming off of Boston and Minnesota, Tampa could be playing for their playoff lives or coasting toward an American League East crown. The New York Yankees. Yes, they won't win the American League East, and winning three of their last ten doesn't look good for a Wild Card bid when they are currently six and a half back of that. But these are the Yanks, they can score 10 runs on you any night, and lucky for them, they get to play spoiler in all of this. One of the few teams that the Rays haven't dominated this year, the Yanks are 7-5 against their division rival and go to the well for seven more games against them. The Yankees visit Tampa for the first weekend in September, and then Tampa visits the Bronx on the tail end of their 9 game three city road trip. The Yankees may not still be in it at that point but veterans Mike Mussina, Derek Jeter, Alex Rodriguez, and Andy Pettitte arent' exactly the type of vets to mail it in, say like a certain outfielder with long dreads, currently on the Dodgers might be. Welcome to professional baseball Tampa Bay, sometimes the season doesn't end in September.